Woubishet, Dawit, Jessica Alvsilver and Juha Siikamäki. 2020. 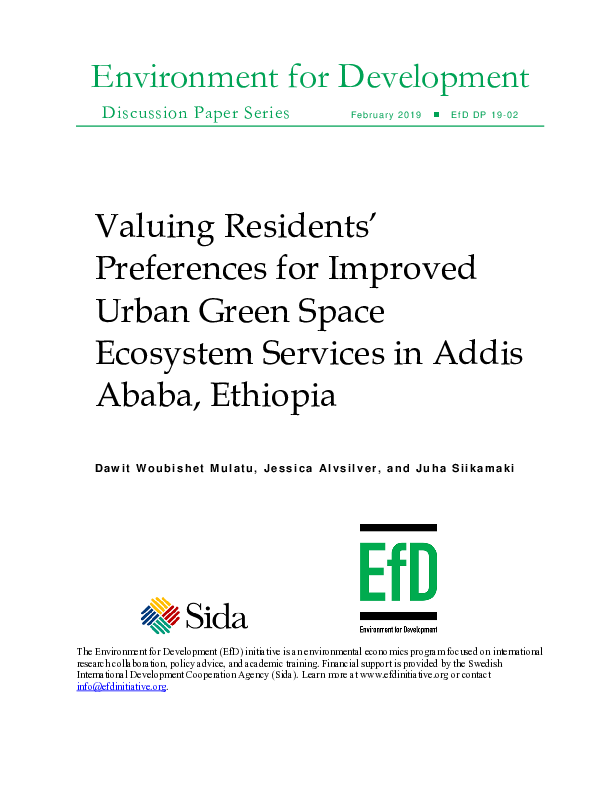 “Valuing Residents’ Preferences for Improved Urban Green Space Ecosystem Services in Addis Ababa, Ethiopia.” EfD Discussion Paper Series DP 19-02. The loss of ecosystems in cities may involve high long-term economic costs and severe impacts on social, cultural, and economic values. However, it is difficult to put a number on the benefits of urban green spaces. Limited research has been conducted on people’s preference for urban green spaces in developing countries and how much they are willing to pay for these benefits. Thus, this research contributes to sustainable urbanization by considering preferences and the value that residents place on potential improvements to urban green spaces in Addis Ababa, Ethiopia. We found that residents would be willing to pay up to 64 Ethiopian Birr (ETB) per month (about USD 2.28) for availability of a large multi-use park close to their homestead. Residents are less willing to pay as park distance to a neighborhood increases. Their next preference was for access to a green walking or bicycling route that would give them the option to access the city without traffic congestion. For this, they would pay up to 6.8 ETB per kilometer per month. For development of spaces for urban agriculture practices, they would pay up to 4.4 ETB per month per percentage improvement. Residents also were willing to pay for urban nature restoration programs, up to 7.64 ETB per month for each percent improvement of urban forest cover. They prefer urban forest conservation to rivers and streams rehabilitation. Our results highlight that city planners should consider the variations in residents’ preferences for urban green spaces and the services they provide.